Ajax-Capablanca Chess is simply a game with Ajax-Chessmen on a Capablanca 10x8 board. There are two setups: One with Ajax-Ministers Ã la Ajax Chess (but without reverse symmetry, above left); and a second with Capablanca's 10x8 setup (above right) but with Ajax-Archbishops and Ajax-Chancellors along the Ajax minor pieces (Rook, Bishop and Knight). Ajax pieces hace the peculiarity of having one-square non-capturing 'adopted' moves that allow them to complete all the moves of a Courier Man or Commoner. Ajax-Archbishops can move like Bishops+Knight, and can also move one non-capturing step orthogonally. Ajax-Chancellors can move like Rooks+Knight, and can also move one non-capturing step diagonally. Rooks, Bishops Knights are as in Ajax Chess. King and Queen move as in Orthodox Chess. 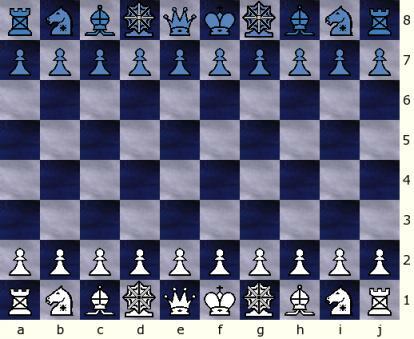 Pawns are allowed a 2-square initial moves. 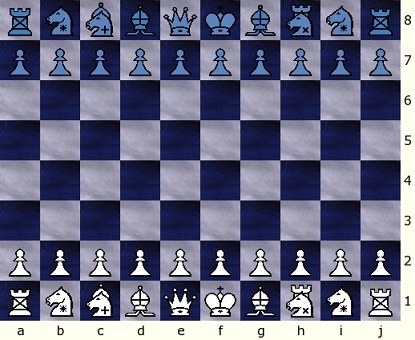 Pawns are allowed to promote to Queen, Rook, Bishop Knight and Ajax-Ministers (in the first setup), or Ajax-ArchBishops and Ajax Chancellors in the 2nd setup. Castling is three squares to either side of the board. Ajax-Capablanca Chess (ACC) was created by JosÃ© Manuel Carrillo-MuÃ±iz, from Puerto Rico in 2009.